2004 Huji - Xingshunxiang "Yiwu Mahei"
Greetings, scholar-priests, sages, and warrior-poets. Today, I bring you further results from Taobao. His Grace, the Duke of N recommended this particular cake to me, which came from 贡马旗舰店 (Gongma Qijian Dian) for a mighty 128 RMB ($18). This is a wonderfully low price for a six-year-old cake, is it not? 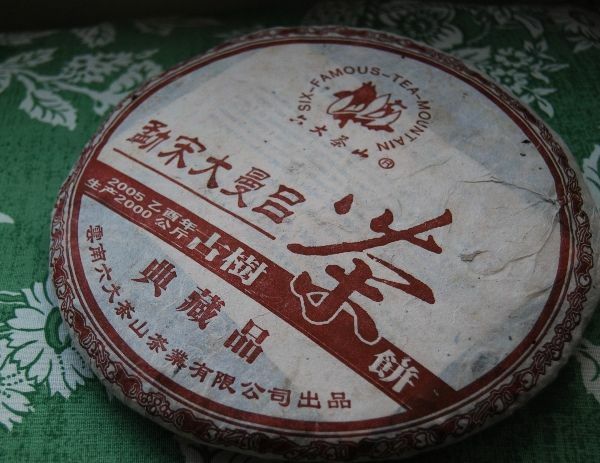 Regular readers may recall my ceaseless love of the equally carefree and whimsical 2006 Xingshunxiang "Yiwu", which trades for the paltry, piffling price of 70 RMB ($10). 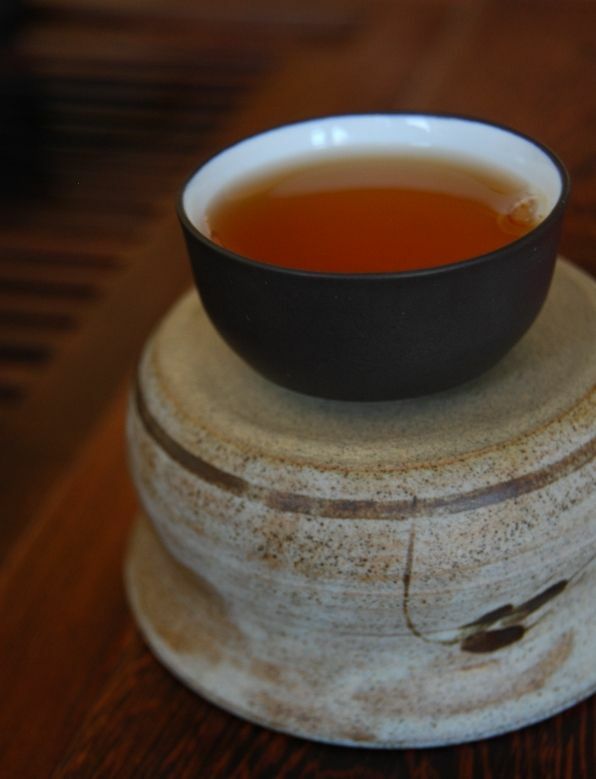 These are not expensive teas - and yet, they are mighty fine. Taobao is the shopping mall of the Gods*, I'm convinced. *N.B. Not all of those gods are beneficent dieties. 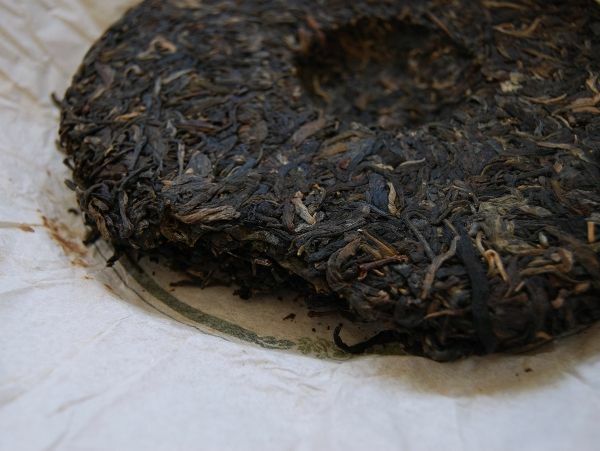 Like its younger sibling, this 2004 cake has lovely, large leaves (pictured below). 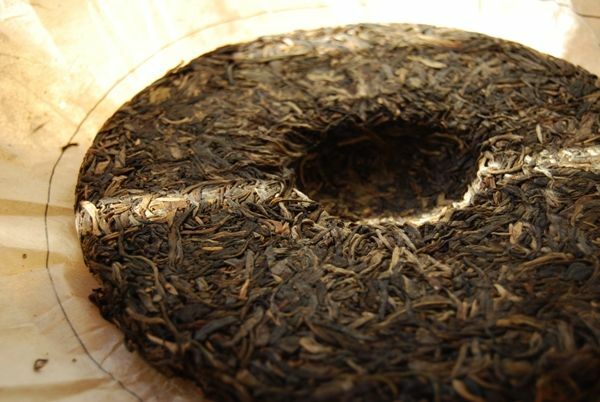 They run throughout the entire cake, and include a mixture from tips to huangpian [yellow flakes], which makes for some potentially complex tea. The compression is relaxed; the cake is louche, as if to say, "Meh - take my leaves." Again like its younger relative, it is sweet, smooth, dark, and almost like molasses. 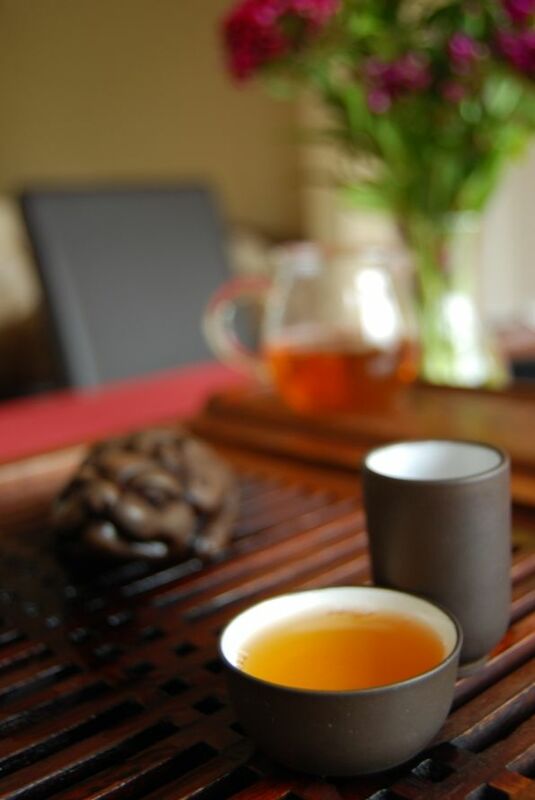 Both Lei and I enjoy this session, in which the tea provides a pleasing, soothing sensation while being concurrently energising. 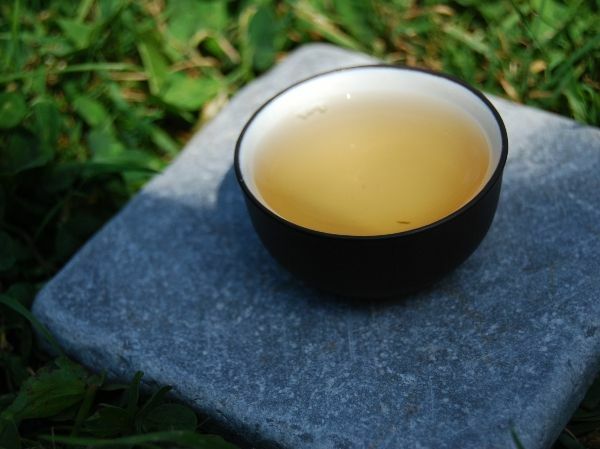 I do so thoroughly love sharp, woody teas, which contain both the joys of youth and some of the depth of maturity. There is a part of me that will be quite, quite sad were all my cakes to age past this sweet point. Hence, I must always maintain a supply of young cakes! Justification indeed. Pre-2006 tea won't be around at a good price forever. This tea is a complete bargain, in my estimation, and I resolve to buy one tong of it. Xingshunxiang appear to be able to do no wrong in my eyes. Be warned, gentle Reader, that this isn't an earth-shattering tea... but it is entirely charming, and wonderfully priced. Let us not doubt the munificence of the gods of Taobao on this occasion. 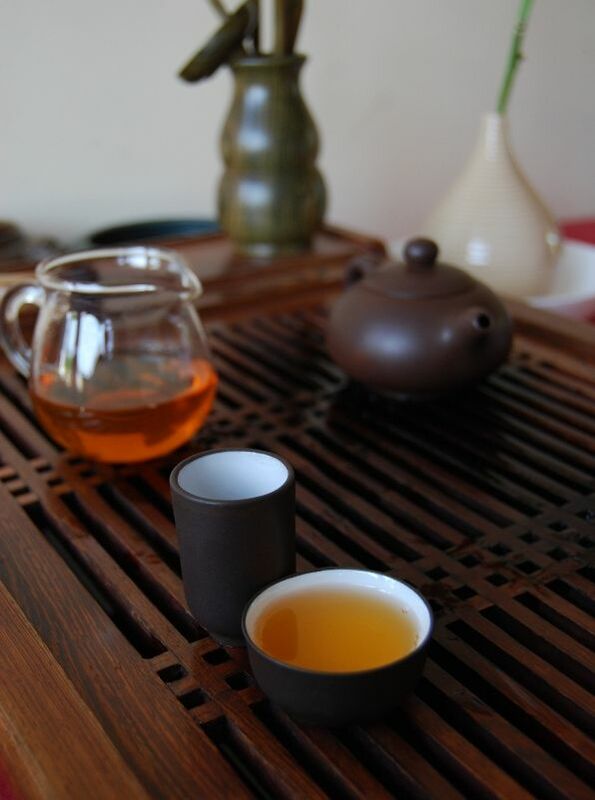 2005 Changtai - Yichanghao, Junlin Tianxia "Chazhong Wangcha"
Yichanghao, how do I love thee? Let me count the ways. 2. You are typically priced reasonably. So, two ways. However, they are important ways, as I'm sure you'll agree. 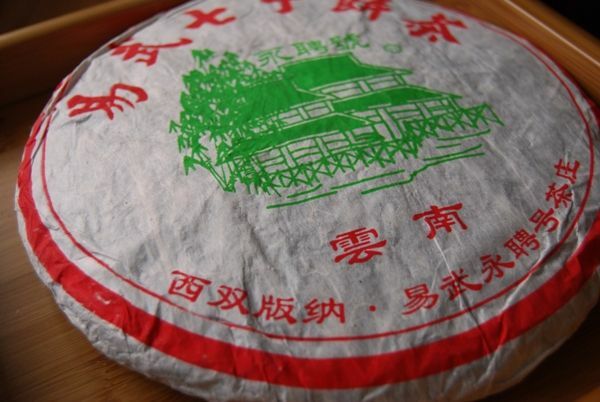 In my continuing quest to taste every Yichanghao cake ever made (I jest), it is with a feeling of gratitude that I plump myself down at the tea-table to enjoy this latest provision from the seemingly endless shelves of Keng, our tea-chum from Singapore. This is a "special production" Yichanghao, and some indication of this status may be gleaned from the fact that the characters for "Yichanghao" have been displaced into a small font, to make way for the rather poncy "Junlin Tianxia" [joon-lin tian-shee'a, the Emperor rules all under heaven]. 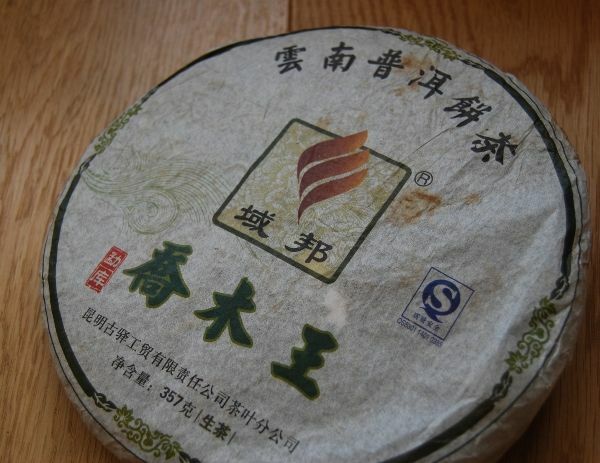 The bing name, across the top of the wrapper, is "chazhong wangcha" [tea-centre king-tea]. These are not subtle, self-depreciatingly humble names. These are pompous, grandiloquent phrases designed to provide "face". 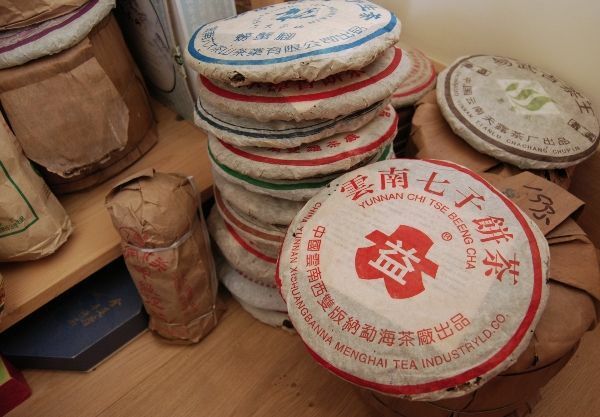 It is not beyond the bounds of reasoning to assume that these have been produced for a tea merchant of the usual Chinese taste for ostentation. Grand though the name may be, this cake does at least look the part. What say you? Those leaves are long and luxurious. 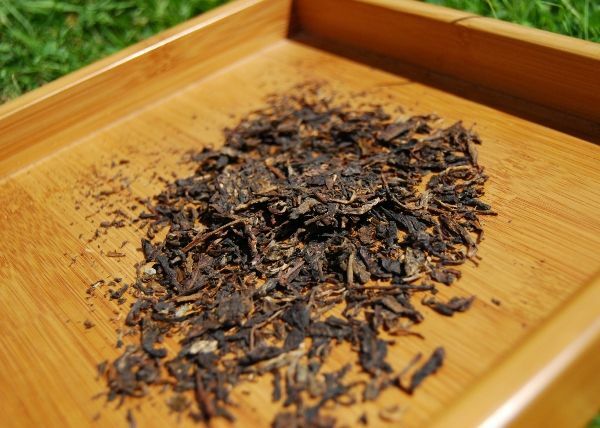 I use plenty of leaves and the result is a highly cooling, sweet, and woody brew. 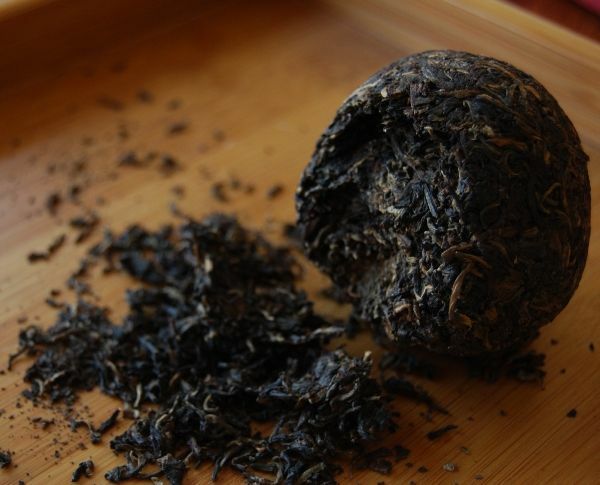 It has a wide range of characteristics, from candy sweetness to a drawn-out finish of tight, sweet woodiness. The body is smooth; the soup is orange, but clean. Seemingly impossible to overbrew (and I tried), it requires longer and longer infusions in order to maintain the charm of earlier rounds of brewing. It is a lovely cake, but too reticent to give me much hope for the future. After five infusions, it is a conflict of man vs. bing to get a solid brew out of the pot. 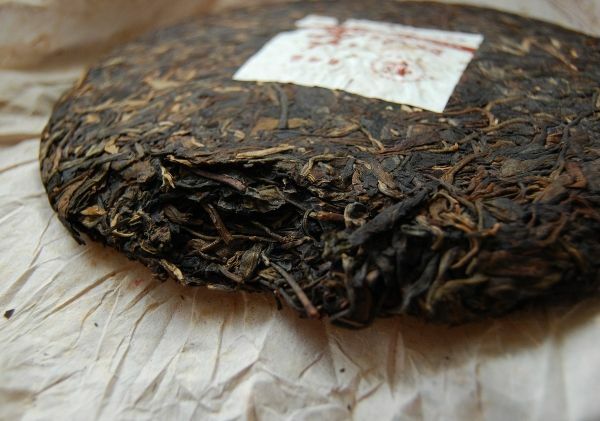 The spent leaves, pictured above, are not excessively red, but what colour there is present in the blend is not uniformly distributed: some laeves are wholly tinged orange, while some are green. This clear blending corresponds with my prior expectation for "made-for-vendor" teas, which need to be grand and instantly appealing, and which therefore lack endurance and the ability to provide much hope for storage. It is elegant and well-produced. At approximately 250 RMB (around $35) from various Taobao sellers, it is nicely priced. As it stands, this tea would make an excellent gift, but probably isn't something one would wish to buy in any quantity. 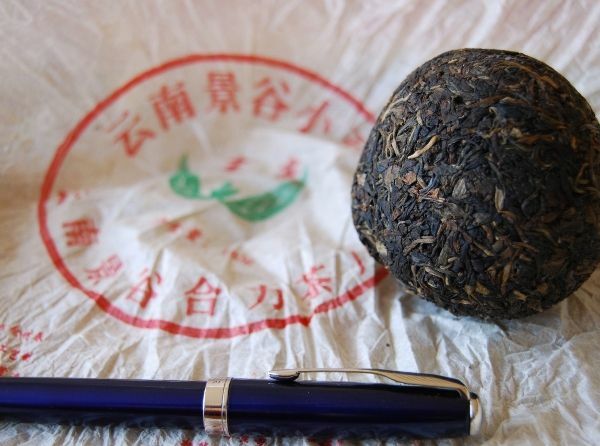 Examples of category #1 include, let's say, some of the upper end of Houde and Essence of Tea products, such as the 2007 Xizihao "Puzhen". 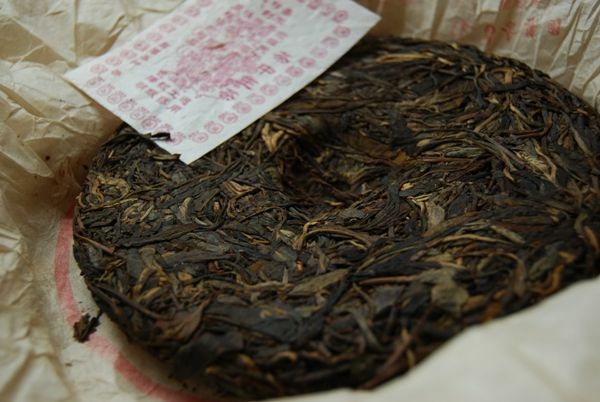 The 2007 Xizihao "Yuanshilin" would be a good example of category #2. It is very nice, but absurdly priced. 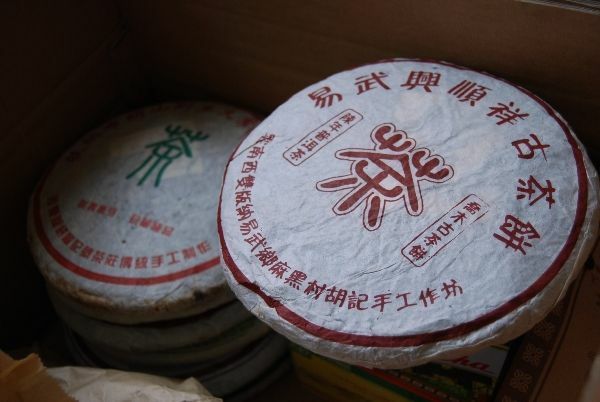 Some of the 2009-2010 Hailanghao cakes from Yunnan Sourcing may fall in this category, too. The obvious gold-at-the-end-of-the-rainbow is category #3. The old 2008-2009 Nadacha cakes fell in this category, for me, and perhaps some of the less expensive 2010 Essence of Tea cakes. I've also found some lovely examples of this category in the back-catalogue of Houde. 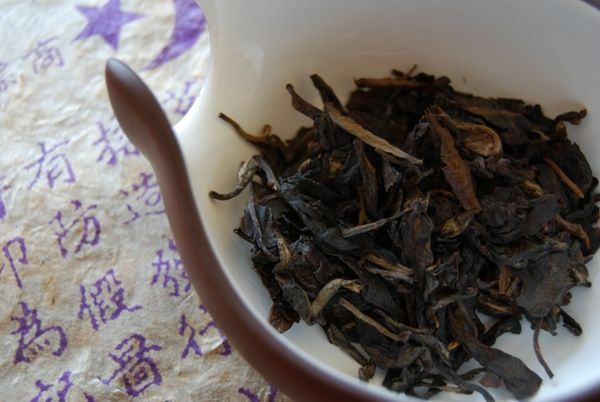 The 2009 Guafengzhai from Yunnan Sourcing was a similar steal*. *Before its recent price increase - I recall that the original price is still available at Jas-etea. Category #4 is the most frustrating, comprising cheap tea sold at high prices, usually based on the business model that the customer knows no better. Jing of London fall into this category, for me, such as their bizarre pricing of modern CNNP. Cheaper tea at realistic prices is the backbone of most on-line vendors: it is cheap and cheerful, and has relatively honest pricing. 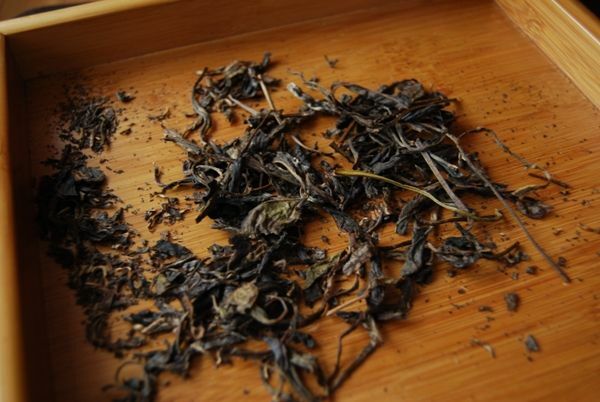 I'd put most of Yunnan Sourcing's traditional output in here, along with China Chadao, Red Lantern, Dragon Teahouse, Puerh Shop, and all of the other old favourites. Yes, I'm sure that they all sell some duffers, to varying extents, but there are plenty of cakes from category #5 available from these vendors. They make good daily teas. 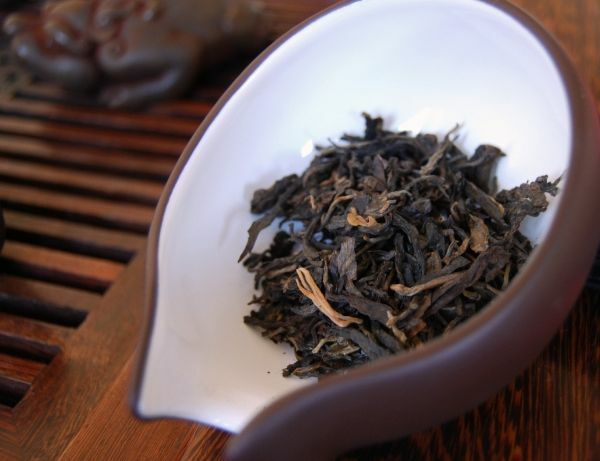 Finally, we have category #6: teas that are just plain bad, and cost next-to-nothing. The 2006 Yiwu "Yongpinhao" of this article, like most Yongpinhao, falls into this category, in my estimation. These are cakes that are simply not worth your hours. I have generally found Yongpinhao products to be over-processed, over-marketed, and very definitely over-rated. Each time I sit down with a new cake from this brand, I am full of hope. Each time, I am disappointed. It has huge leaves, as you may see illustrated in the above image. You can also see that they are darker and redder than they "should" be, were they raw leaves. This is no problem for a four-year-old cake that costs a trifling 65 RMB ($9.50). I'd be surprised if it were anything else, at that price. I struggle to fit the lovely long leaves into the pot, and opt to soften them with a little warm water prior to doing so. Even opening the wrapper produces a deliciously sweet aroma. My hopes have never been higher for a Yongpinhao. The first infusion is just as charming, being sweet and creamy (not unlike the little Douji bricks). It is pungent and full in the mouth, and lasts very well. Sadly, that's where my hopes pop like a balloon. The second infusion onward crack into a sour and "brown" flavour that will not depart, despite over- or under-brewing. Yongpinhao was ever thus: all promise, and thoroughly intolerable after an infusion or two. I appreciate MarshalN's recommendation to look at this cake - certainly, it could have easily been a category #5 tea if I had stopped at the first infusion. As it is, I found it to be just the like the rest of the "YPH" product range, and have relegated it to the "I hope this ages into something better" shelves. Addendum: this came from 聚今古茶庄 (Jiujin Guchazhuang), from Taobao. 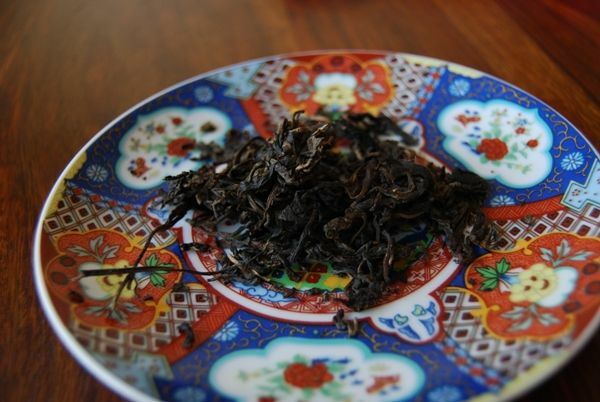 2008 Guyi - Yubang "Mengku Qiaomuwang"
I made a great mistake, the morning that I first drank this tea. 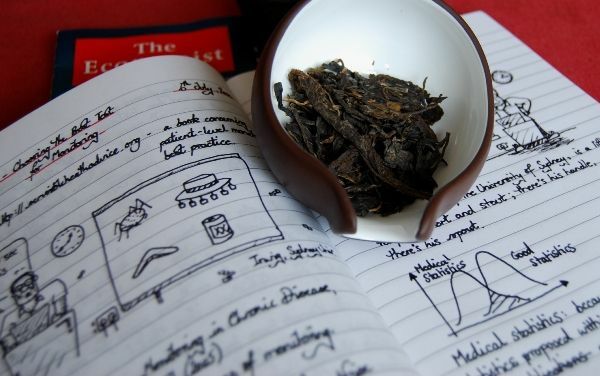 I sat down at the tea-table, before breakfast, as is my habit, with a student thesis to mark. Silly me. Mixing work and tea is an error of the first order. Before too long, I found myself with a feeling of agitation, thesis pages covered in red ink, and without much appreciation of the tea. A second sitting with this cake (kindly provided by Keng) was in order. 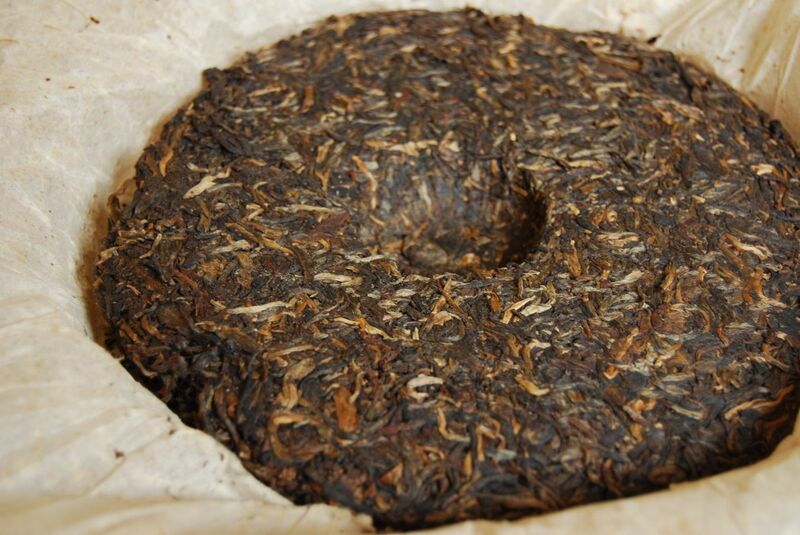 As with previous Guyi cakes, this one is instantly appealing - the long leaves, the darkness, the sweet aroma. As with other Guyi, it is limited, but enjoyable. This one is probably the least accomplished of those Guyi teas that I have tried lately, containing a sour bitterness, some pine-like sweetness, and a quiet aroma. 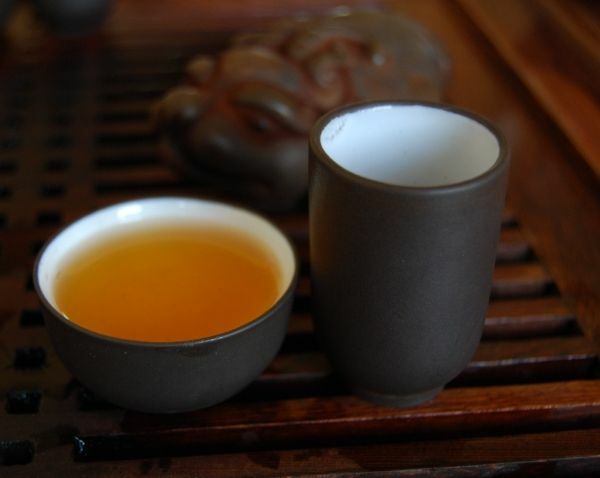 "A simple tea", noted Lei, as she took a cup in passing. This is a fair assessment. Not the world's best, but certainly much better when not taken in conjuction with attempting to mark student work. That said, the student in question (after handing in pieces of work that I returned heavily red-penned) just turned in a draft of her thesis which is literally first-class in quality. There's nothing quite so satisfying as seeing a student suddenly produce something brilliant. After wading through turbid, opaque prose for so long, her latest thesis draft has a pure, crystalline quality beloved of all scientific writers. Buying from Taobao is a real adventure. The range of available tea is vast, it's usually fairly reliable, and, sometimes, you strike pure, unalloyed gold. 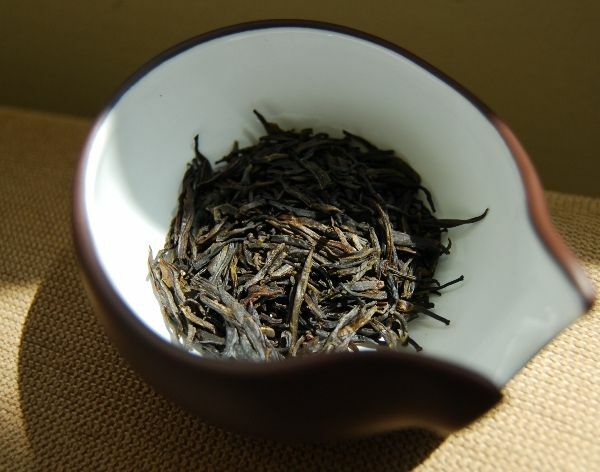 I buy via Taobaofocus these days, which has the best shipping rates of those I've tried (including Panli and Taobaonow), combined with excellent service - including photographs of your various teas taken in the Taobaofocus warehouse prior to shipping. I recommend the use of SAL - products aren't usually going to sell out in a few days on Taobao, and I'm happy to wait a fortnight or so for an arrival. However, their Airmail and EMS rates are the lowest I've encountered, should you be in a hurry. 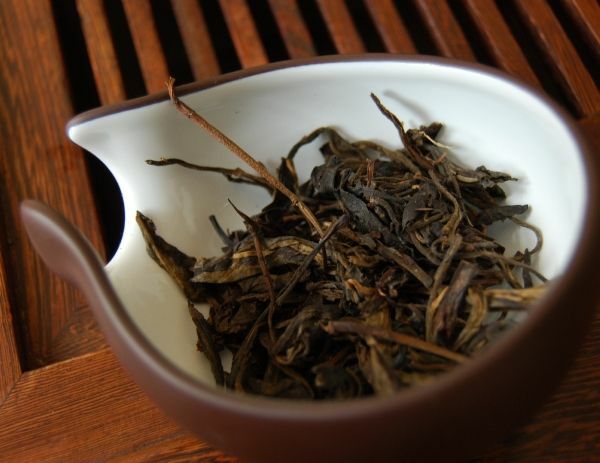 Shipping costs add up quickly, however, because tea is heavy! Hence, SAL. 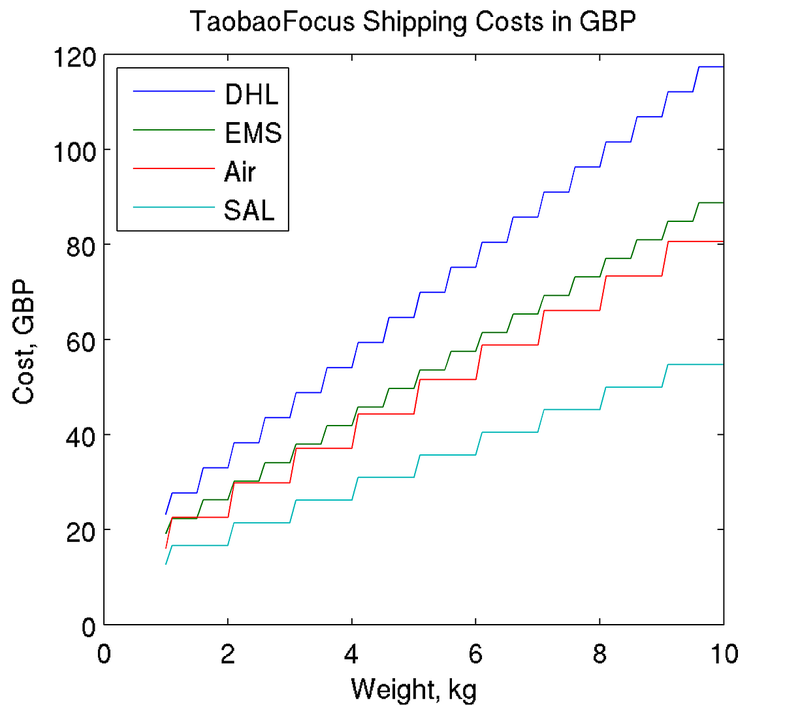 Taobao Focus shipping costs to the UK are shown above, with RMB:GBP at the exchange rate currently quoted by Google. This cake was previously described by your friend and mine, His Grace, the Duke of N. I'd encountered a sample from Essence of Tea kindly provided by someone whose identity eludes me (thanks again!). I bought it from 999我心依旧 (999 Wo Xin Yijiu), on Taobao, for the offensively low price of 200 RMB (below £20, $30). I'll discuss the vendor a little later. Let's consider the tea, first of all. This cake is worth your attention. I certainly found that it held mine throughout the sessions I've had with it. This is a chubby cake, comprising big, fat leaves (pictured above and below). The soup, as you may see below, is clean, fresh, and nicely orangered. 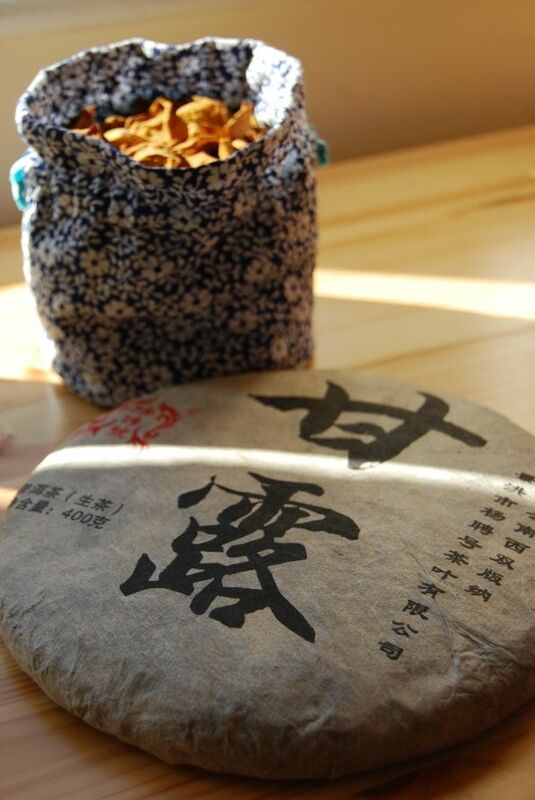 The character of this tea described in one phrase is "spicy wood": it has a decent, solid presence, with plenty of complexity waiting around in reserve. We encounter a floral aroma in the finish, and a long, strong aftertaste. 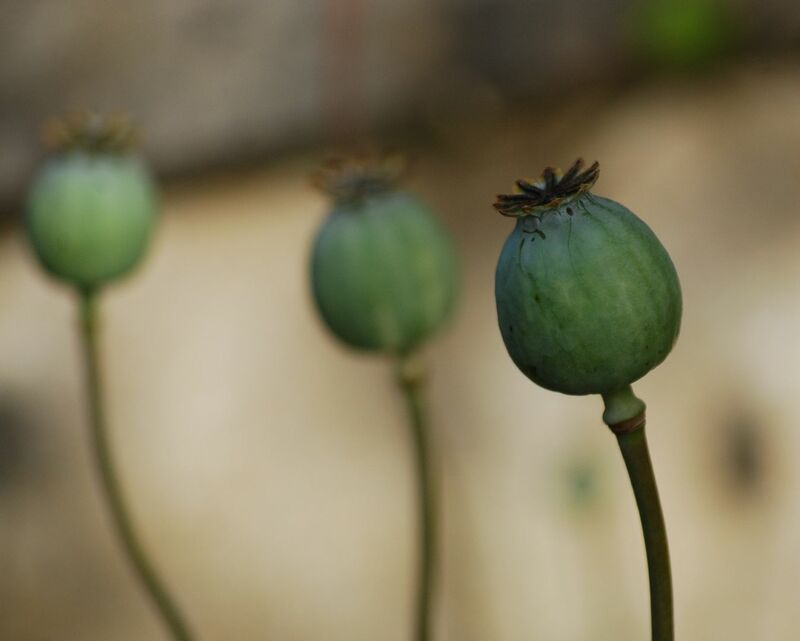 It has been stored well, and has good duration - indication enough that it hasn't been prematurely stripped of its content, at what is coming on for the ten-year mark. So! $30 for a lovely, charming tea? A bargain! Surely I should be buying a tong or two of this without hesitation? If only life were so simple. It turns out (from two Guangzhou-based correspondents, who wrote to me independently) that the vendor has a particularly poor reputation, locally. Before finding out this, I joked that anyone who names their business after something related to Titanic / Celine Dion ("woxinyijiu" approximately means "my heart will always go on") must be treated with extreme caution. 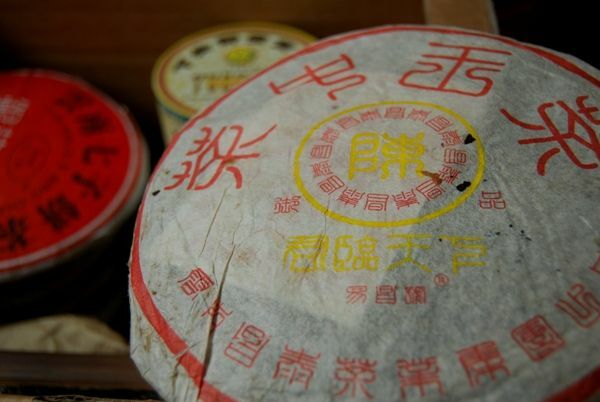 One correspondent said that he had even visited the vendor's premises, and had been offered clearly fake tea, supposedly over a decade old, for less than 200 RMB ($30). "It's not the kind of place you'd spend your money in, if you visited it", he wrote. To be fair, he also reminded me of the saying, "If it tastes good, who cares if it's fake?" 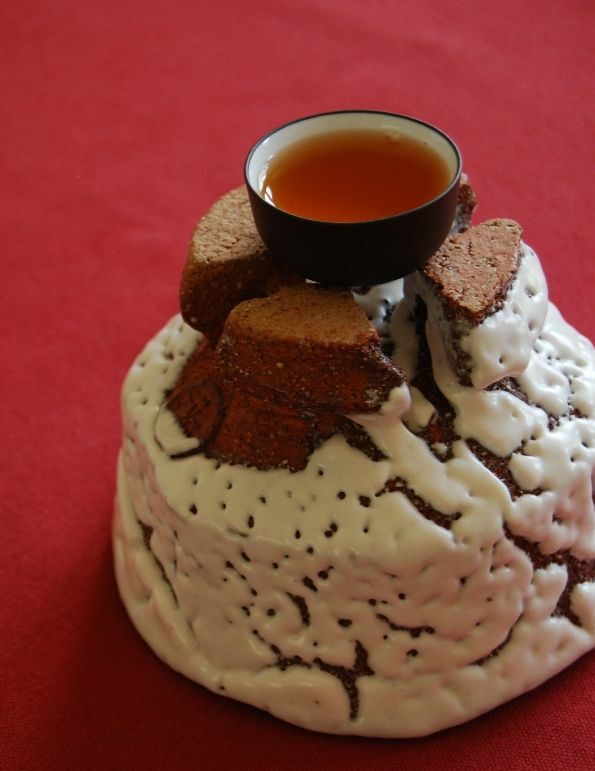 I don't think this cake is a fake, as it is very similar to the Essence of Tea version, which I understand to have been procured from a vendor in Taiwan. However, the reputation of the vendor has given me significant pause. Should I order a tong? I have letters from several readers indicating that they have bought single cakes from this vendor which all turned out well. And so we are all teetering on the threshold, wondering about tongs. Who will jump? Perhaps me! This cake turned out very well. 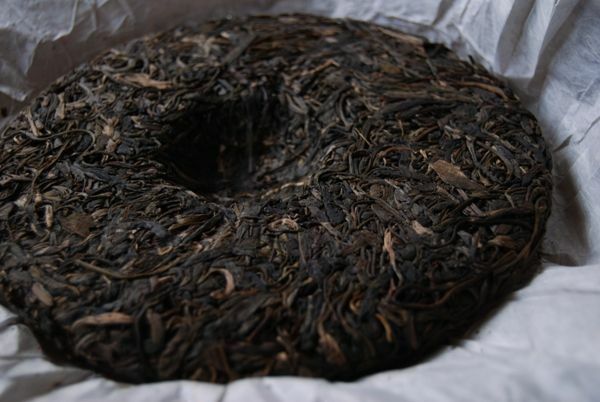 The seller, despite her poor reputation, provided a whole tong of perfect-condition tea, and even gave me an eighth cake for free. It remains sweet, dense, and pleasant. 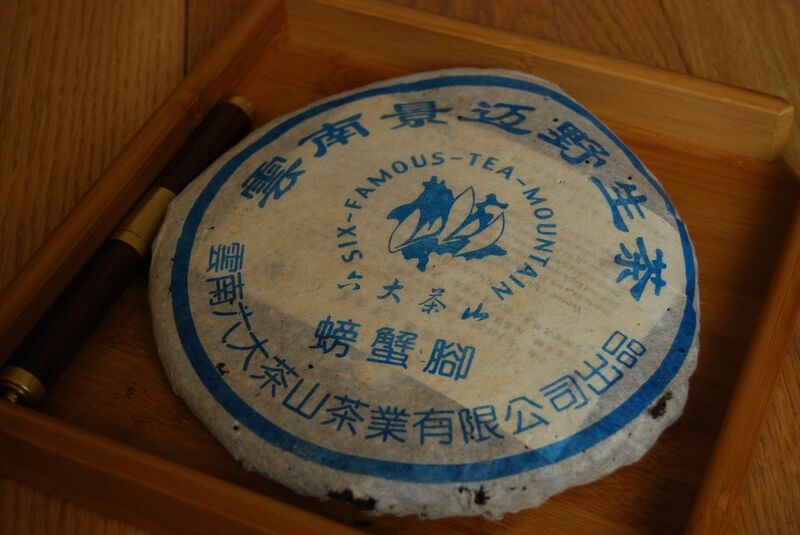 When we previously tried the 2004 Yangpinhao, Mr. Yusko reminded me that my mother-in-law says I have too much tea. 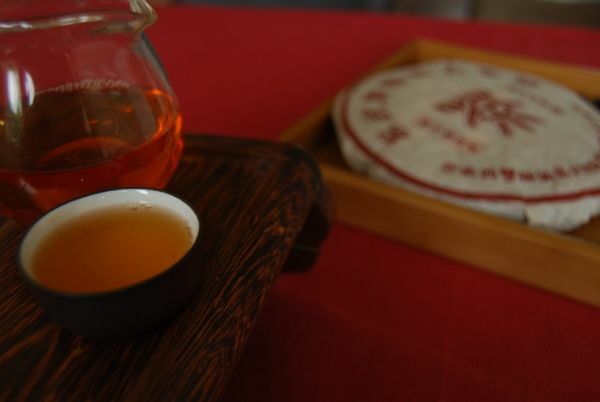 One occasionally sees photographs of houses laden down with pu'er, and I'm relieved to write that our humble abode is definitely not that bad. Yet. 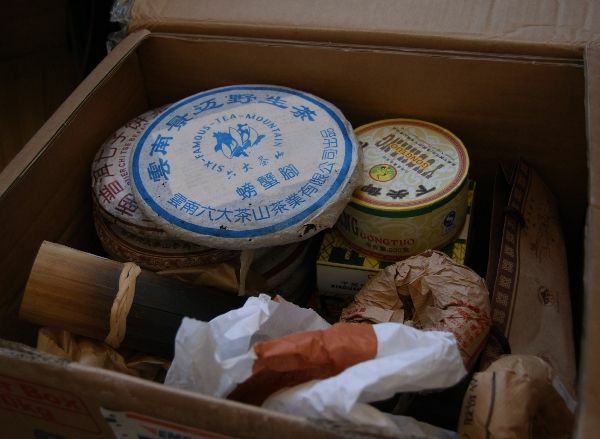 However, "Chinese Mama", as she is known in our home, saw neither a triple-stack of large plastic storage containers filled with pu'er, nor the various boxes that have been arriving thanks to the generosity of Keng, and which we've bought from Taobao or Essence of Tea (many of the latter of which are still stored in my office, until our seemingly-Sisyphean house renovations have stabilised). 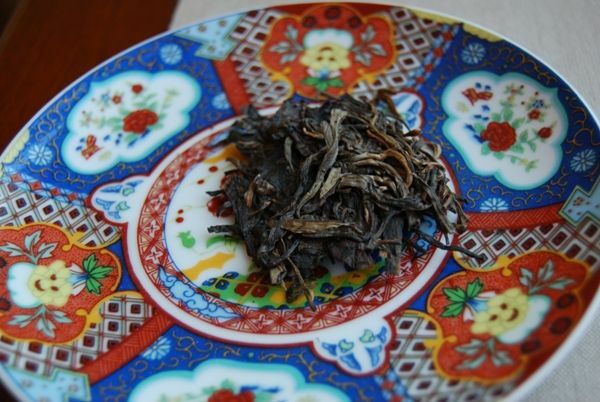 In one of those hidden containers, this delightful Yangpinhao "Ganlu". The cake's name is "sweet dew", which strikes a nice line between poesy and naffness. 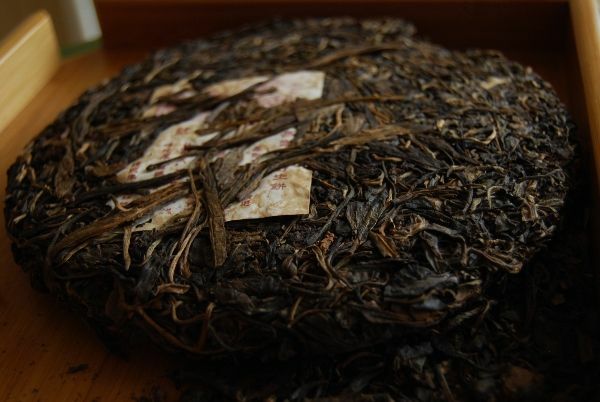 It would take a heart of stone not to be wooed by the appearance of this tea: big, long leaves combine with a good, dusty shengpu aroma that brings hope to the spirit. 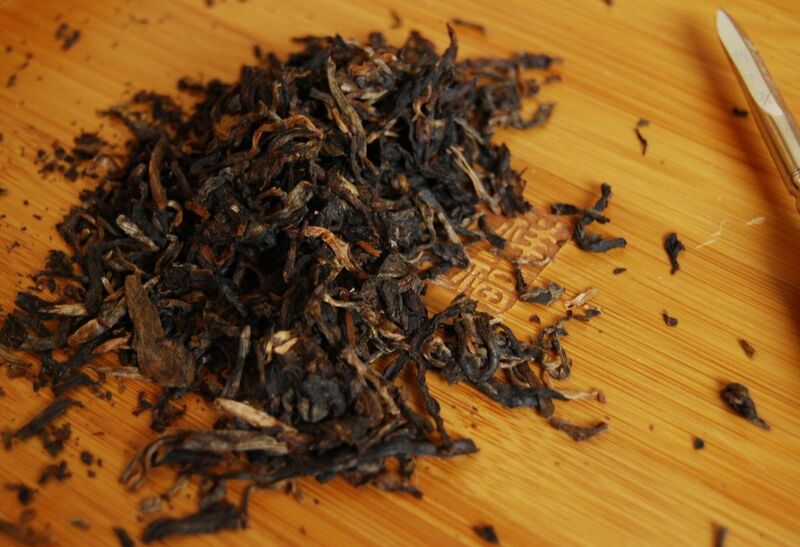 I estimate that this is a blend of raw and somewhat processed leaves - it has a leather darkness that cannot be achieved from nature alone, and yet it also has a sharp, bitter flavour (kuwei). The producers have done well, and this is not imbalanced in either direction, making it enjoyable yet slightly challenging. It is a solid, reliable cake, with decent energy and a pleasant huigan. I wouldn't pursue any more of this, as I am strictly limited to buying only exceptional cakes, these days, given the size of our collection. While not exceptional, it makes for an enjoyable, low-maintenance session. Can drinking tea be described as being a "hobby"? Is it merely a daily beverage? Part of a health regimen? A meditative expression of the ineffable onenesstm that exists behind every moment, inviting scholars and sages to transcend the dust of this world*? Whatever your take, tea certainly has a unique charm. It would have to be charming in order for you to spend time reading about it, and for me to spend time writing about it. I've come to appreciate that there is no such thing as a bad tea session. There can be "bad" tea, in the sense that some tea can be as rough as a French woman's legs, or as bitter as a graduate student in the liberal arts. However, even grim tea can be redeemed. 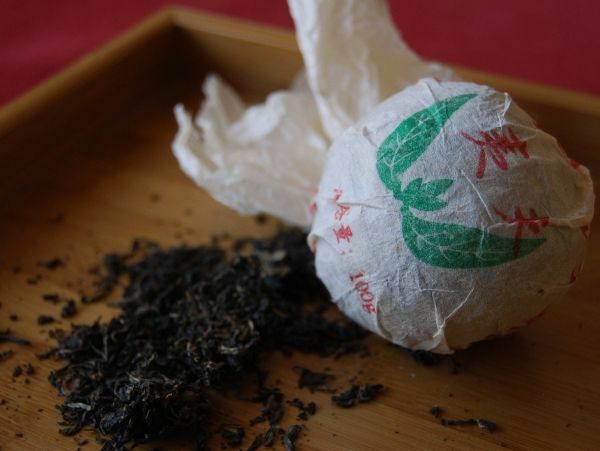 A careful eye and a conservative hand can tame most leaf-based nastiness, and I find that even the cheapest "bad" tea can give you a little of that aforementioned charm at the tea-table. 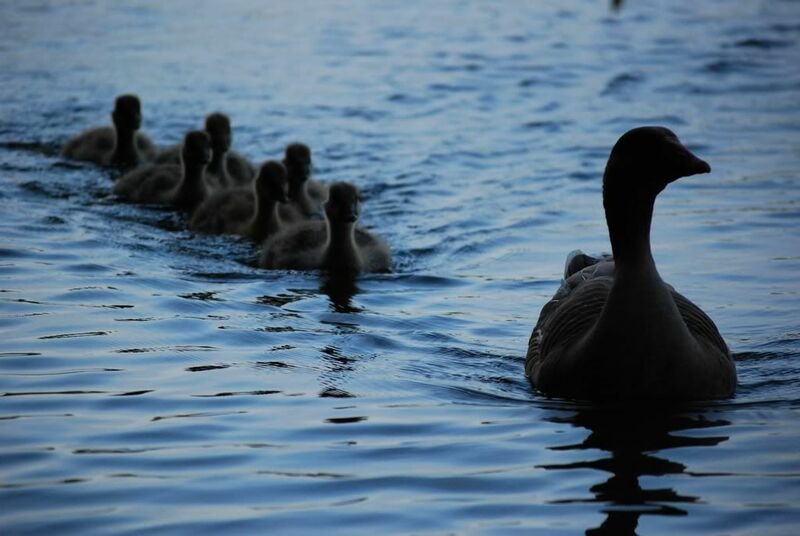 Maybe it's just a glimpse of that ineffable oneness (see above), maybe it's something less exalted. The Zen writers that most appeal to me make the point that Buddha is nothing more exalted than you sitting at your tea-table. The dribble of water leaking from the lid. The crusty bit of old leaf that's stuck in the water tray. The wilted flower that dropped its petals next to the kettle. There is no dust to transcend, I'm afraid*. Which brings me nicely onto the 2005 "Mengsong Big Manlu" from 6FTM. Many would consider this to be an unexalted tea. It would be hard for even the most florid and baroque of writers to imagine robed, long-whiskered scholars breaking open this cake and experiencing the one true ubermind while trying to wrestle some good brews from these aggressive leaves. Then again, I'm not convinced that such characters ever existed. I never did believe in romantic nonsense concerning scholars and sages, and assign them more to the sentimental dreams of modern writers than to actual history. To me, scholars are real people - they spill their breakfast on the dining table, they get itches in unmentionable places, they get sunburn and hiccups and all manner of other unromantic conditions; they eat, sleep, and process food in exactly the same way that all real people do. 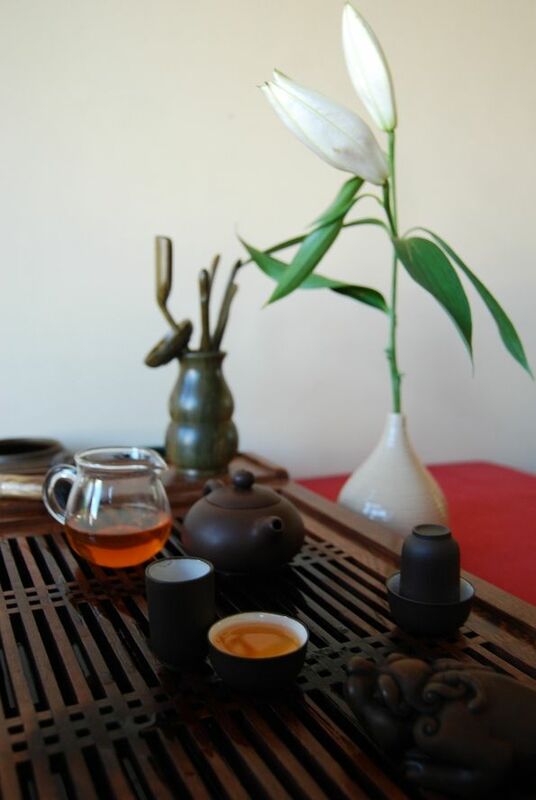 Ditto Zen masters, devout monks, warrior-poets, and the entire panoply of overly-romanticised characters to which we are introduced in most tea writing. If, like me, you roll your eyes and turn the page whenever a tea-book mentions the words "scholar", "ineffable", "wind soughing in the pines", or "luminous beings are we, not this crude matter", then this 6FTM cake could be for you. It's a very "real" cake. This tea is clean, fat, leathery, and dark. It fights, it is "lo fi", it is brusque. I rather like it. 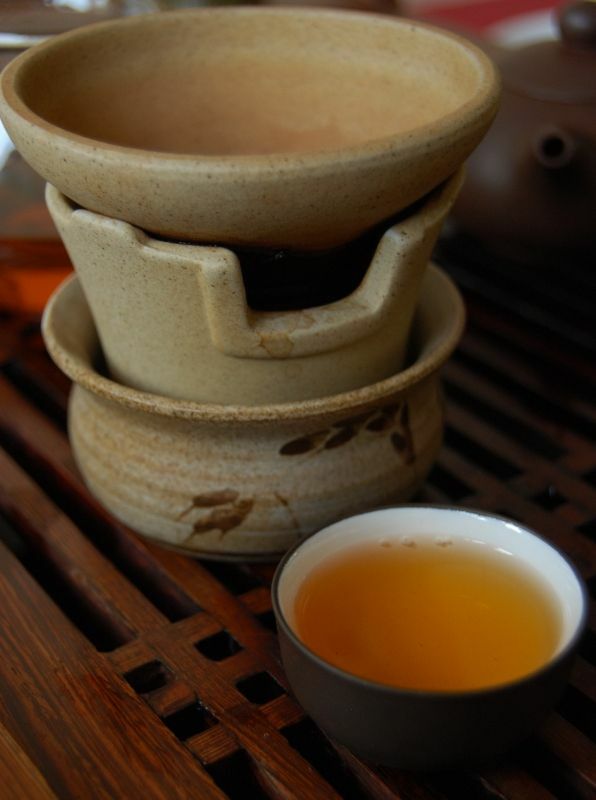 I would invite any ineffable sage to come and join me at my table for a pot of this tea. We would share its surprisingly complexity - hints of toffee, hints of cereal. We would enjoy its long, long huigan. We would get to grips with its substantial kuwei [bitterness]. While observing its limitations, we would enjoy it nonetheless. Real scholars have inky fingers, stiff shoulders, and paper cuts. As you may remember, I set very little store in novelty cakes - where my definition of "novelty" is particularly conservative. Thus, purple-leaf cakes would usually be classified as such by me, and consequently afforded little interest. 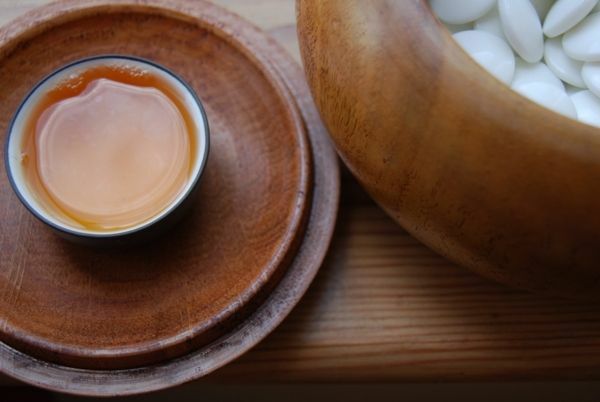 You may have noticed that I tend to write mostly about orthodox shengpu, which reflects the types of tea that Lei and I drink. Having received this cake as a generous "review cake" from Jerry at China Chadao, I kept my hopes at an appropriate level. You can't deny that its presentation is excellent! It reminds me of Gelugpa garments. I'm never very good with opening paper seals (pictured above), because they tend to destroy the wrapper to which they have been glued. While I appreciate the gesture towards "security", I must admit that I wouldn't miss such labels if companies stopped using them (especially Dayi). "Only a fool cannot change his mind." This is a phrase that I have heard several academics use to illustrate the fact that one must keep an open mind. Part of the inquisitive process is to be open to the fact that your assumptions may be incorrect, and it is the sign of a healthy mind to be able to question itself and adapt to new evidence accordingly. 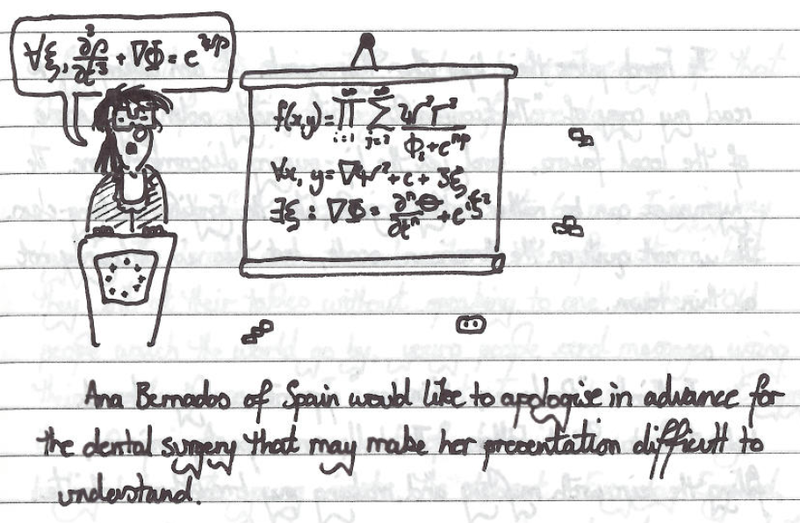 While I can't claim to be the world's greatest scientist, I try to be willing to be proven wrong. 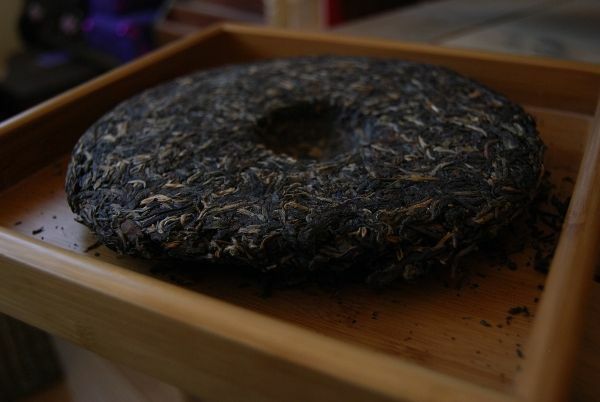 This "ziyawang" [purple-bud king] cake has gone a long way to changing my prior assumption about purple-bud productions. It looks, smells, and tastes highly pleasant indeed. I tried this tea on the most complementary day possible: the hottest we've experienced in this already rather hot summer. The clear, refreshing sweetness of this charming cake was the perfect tipple for such a day. furthermore, I took the afternoon off work especially to enjoy this tea, and hence I provided it with a most advantageous environment. Appropriately enough, purple leaves come about as a protective mechanism against the presence of strong UV. That it proves to be such a deliciously appropriate summer-time tea is a charming coincidence. It's tiny-wee, it's as solid as a ball-bearing, and it's five years old. Ladies and jellyspoons, I give you the "Xiao Wuzi" [sheow woozer] from Jinggu Heli [her-lee]. It really is very tight. In fact, it's tighter-than-Xiaguan kind of tight. It's chisels and hammers kind of tight. Bash it enough and you may be lucky enough to break away a few leaves, as shown above. The leaves are old-fashioned, highly-chopped, and black as your proverbial hat. It's a very nice little tea. For some reason, it has "Yifu" [husband] written in the middle of the wrapper. As shown below, it brews up a clean orange colour. It's woody, sweet, and sharp - quite charming, in fact. 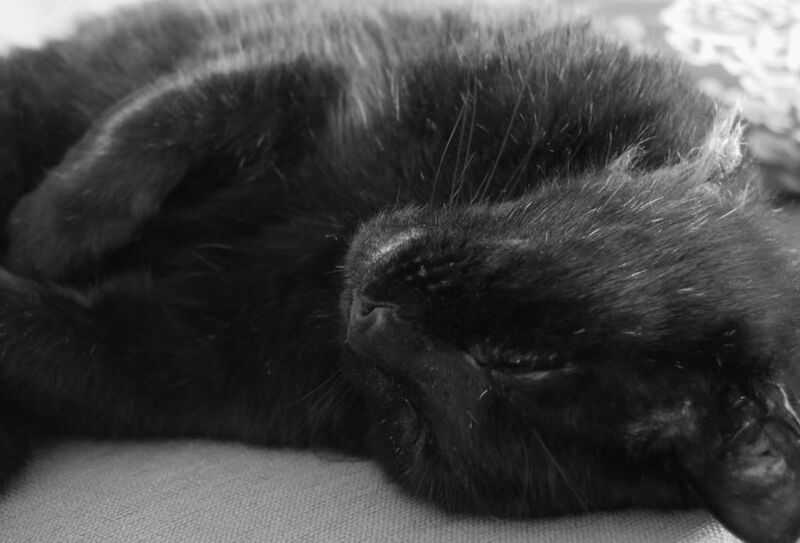 It can't be said that this is a particularly extravagent experience, but it's a jolly, solid little creature. 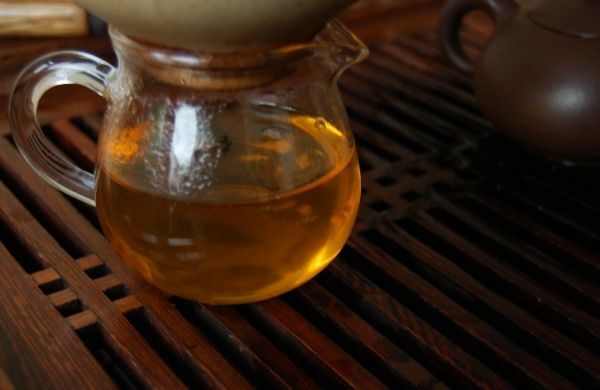 It continues unchanging for many infusions, and shows that it has been nicely aged. I've never seen such a little entity before, but am happy to have enjoyed this tasty little nugget - thanks to Keng for providing it. 2004 Menghai - Dayi "7532"
I have a hypothesis. Like all hypotheses, this one gives an explanation of the observed facts, and makes predictions that may be tested. It may or may not be correct, but I present it to you for your consideration. Is it as easy as 7-5-3-2? I contend that some of the "solid, reliable recipes" have changed. I contend that "7532", while surely fluctuating from year to year according to the minute changes in leaf character and blending that one would expect with the passing years, is significantly different to how it used to be in 2004. I contend that this difference is more significant than small changes due to yearly harvests. Let's examine the facts. 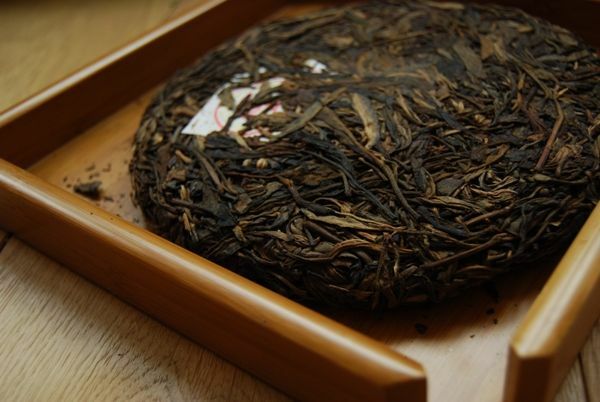 Crack open a modern-day 7532 and you'll be confronted with the usual Dayi experience: densely compressed, brisk Menghai aroma, familiar straw-and-mushroom character. Dip into an older production of the same recipe (here, 2004), and it's a very different affair. 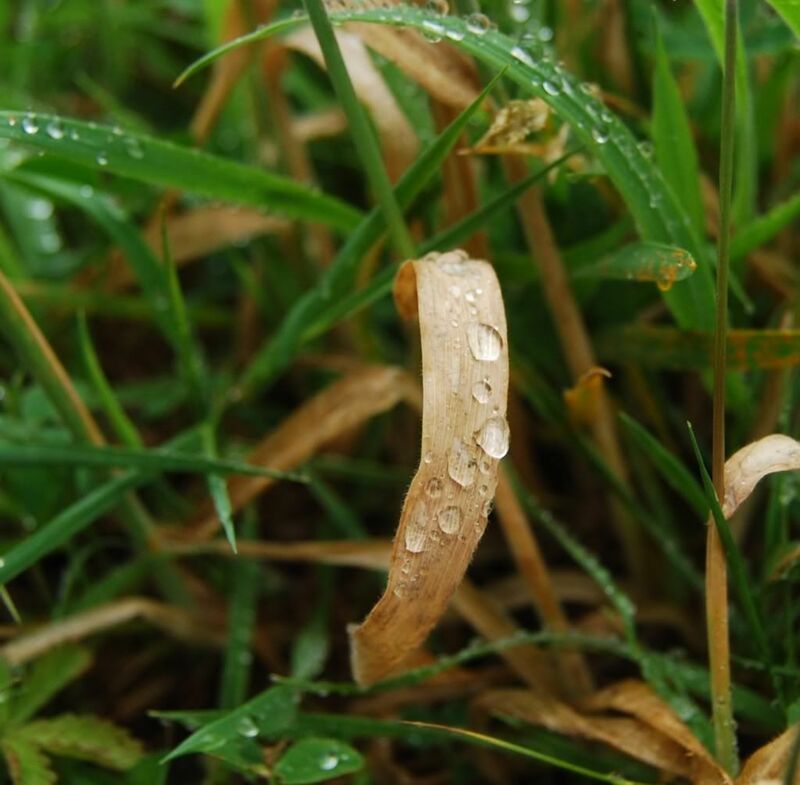 The leaves are much larger, on the whole - which may not come out in the photograph above. The change in compression is obvious: the older cakes have a larger diameter and a larger thickness than the newer cakes, and are more loosely compressed. 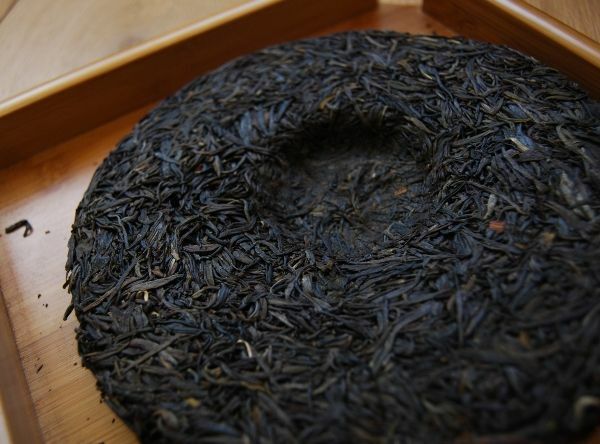 Modern Dayi cake are relatively tiny, compared to most 375g bingcha. 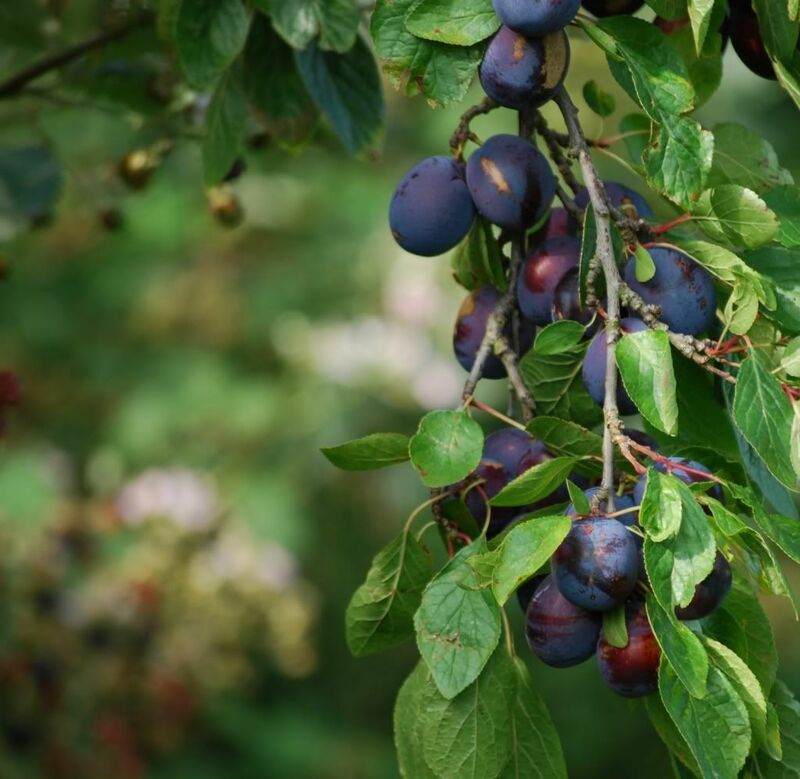 The older varieties also seem much more punchy - truly hair-raising. As they have aged, they have retained this power. There is more in the older cakes, evident from their youth, and continuing as they age. It's fascinating. Is there any mileage in my hypothesis? Perhaps, perhaps not. While I continue to buy small amounts of modern Dayi, it must be said that the older 7532 and 7542 attract my attention a little more. If we tentatively accept for now that there may have been some shift in production, when did it occur? I've had 2004 and 2005 cakes that were of this "older" style, and so offer you a date of 2006. I don't remember trying a 2006 cake of '32 or '42. 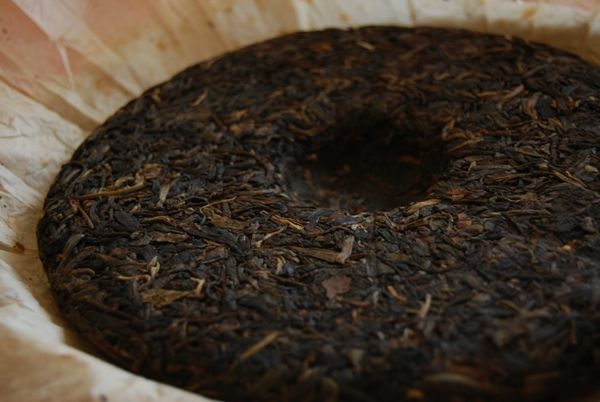 The 2007 cakes were certainly of the more modern super-compressed, smaller-diameter variety, with a more rough-and-ready quality of leaf. Either way, this 2004 cake is a sterling example of good Dayi. It is heavy, long, and sweet. This particular cake is right at the age I enjoy the most: the turn between yellow youth and woody adolescence. It contains both power and woodiness. Happily, it marches on forever - my more recent 7532s tend to fade out earlier. As with all hypotheses, I invite you to confirm or refute it at your pleasure. Be sure to disseminate your findings! 2003 6FTM "Jingmai Yesheng Pangxiejiao"
Novelty cakes! They are as consistently appalling as one might suspect: shupu wrapped in tangerine skins, rice-scented shengpu, hand-braided leaves. Maybe you've found some beautiful examples of such creations - I would love to be proven wrong - but my limited experience indicates otherwise. Such was my prior assumption when faced with this 6FTM cake, kindly provided by Keng, which has "crab's feet" [pengxie jiao]. Far from being cancrine tootsies, as one might otherwise expect from the name, these are vines that wind themselves around the trunk and branches of the pu'er tree. 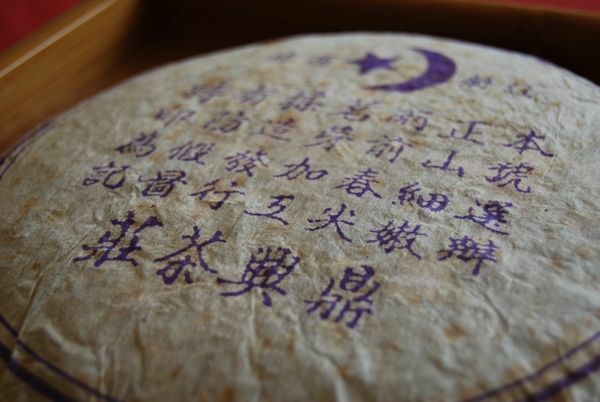 To be honest, unless the wrapper had told me, I would have thought this to be an entirely normal pu'er bing. Have a gander at the photograph below - do you see any crab's feet? When the leaves are broken up, the additions are revealed: tip-coloured fluffy entities that blend into the other leaves. The majority of the bing is, I am glad to report, made of tea. As far as the flavour goes, this is a very pleasant tea. It is sharp, woody, and powerful, not unlike the other older 6FTM cakes that I have described in previous recent articles. It is strong, vibrant, and properly raw. Maybe the crab's feet have contributed a little of the tar-like character that I associate with huangpian, but it's light - and rather complementary to the tea. I bought a trio of these cakes for £28 / bing from Keng, mighty teachum of Singapore. I'm rather glad that I did so. 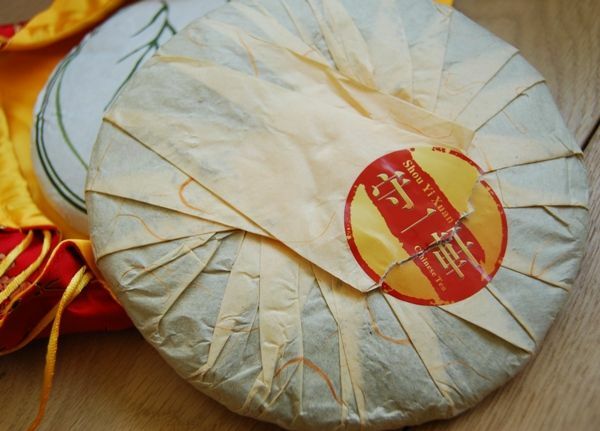 The cake is as aromatic as ever - the deeply humid Singaporean scent has aired a little after three years in England, and the colour is as before: dark, slightly orange. 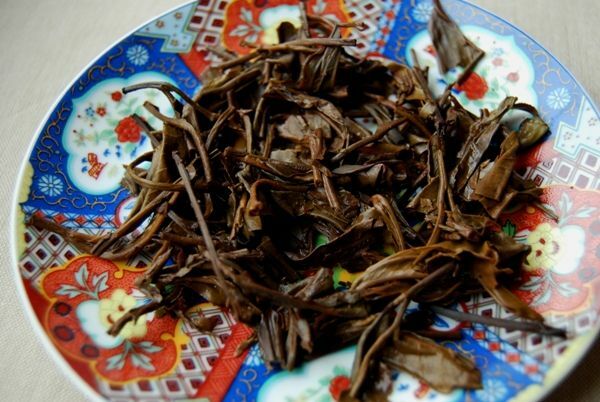 The contribution of the pangxiejiao [crab feet] is shown below - they are a minority component in the blend. It turns out that this is a good thing, because there is a noticeably bitter contribution from them, which I am surprised that I missed during my session in 2010. It is a good addition - a little extra kuwei [good bitterness] in the finish, that rather reminds me of kudingcha (a tisane, very bitter as its name suggests). 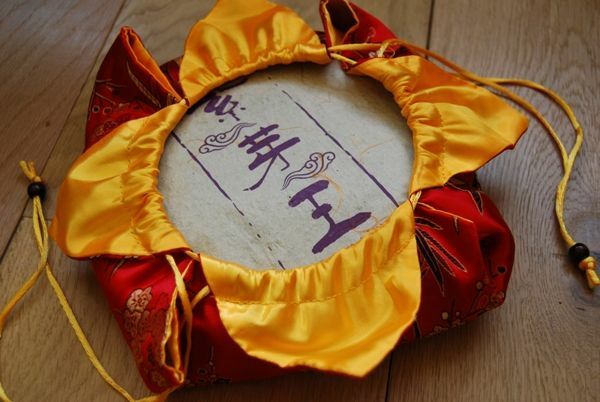 Surprisingly, there is even a hint of Jingmaishan "lanxiang" [orchid scent] for which the region is known. The leaves are doing very well: they have the sharp woodiness of good, Singaporean storage. 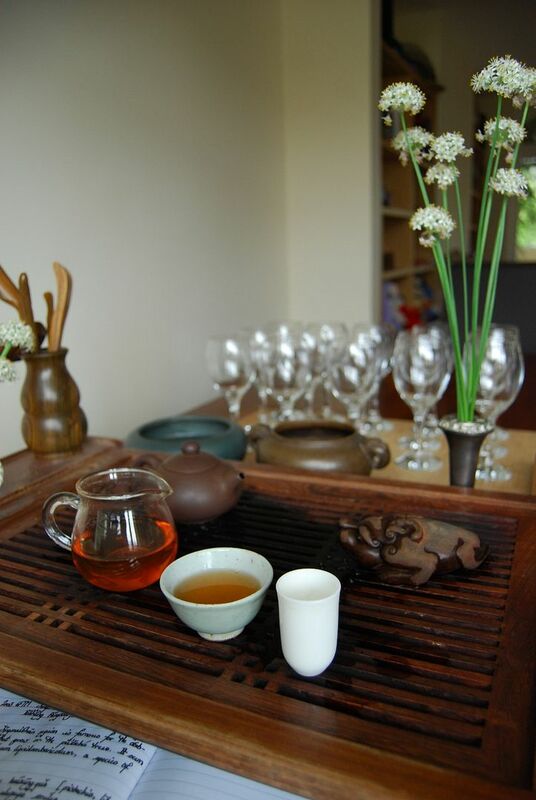 Summer Wulong, and the 2001 Jinchanghao "Yiwu"